Talks over the future of major wholesaler Palmer and Harvey are being held with a number of parties. There have been reports for some weeks that P&H is struggling with debts and owes substantial sums to key suppliers. The BBC understands two cigarette firms, Imperial Brands and JTI, have extended loans to P&H while private equity firm Carlyle prepares a bid. P&H, Britain's main cigarette supplier, is the UK's fifth biggest privately-owned firm. It also delivers 12,000 products, including food and alcohol. It supplies about 90,000 outlets around the UK including major chains, convenience stores, corner shops and petrol station forecourts. P&H technically has until Saturday to secure its future, the date at which a number of credit lines are due to be repaid. Imperial Brands said earlier on Thursday it was working "to create a sustainable future" for the company. In its statement, Imperial said: "Further to overnight media speculation, we confirm that we have been working, together with other stakeholders, to seek to create a sustainable future for the UK wholesaler, Palmer & Harvey, with whom we have a close trading relationship." 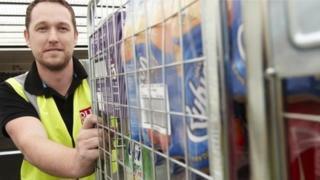 David Gilroy, independent retailer expert at Storeexcel, said H&P was in a tough business: "They make thousands of deliveries to stores every week and making profit from small stores is very difficult and margins are tight. "There's the cost of vehicles and manpower and the profit yield per route is tricky. There are lots of small drops, the unloading time is 15-20 minutes each stop. It's a delicate balance to make profit like that." Rival distributors to P&H include Bestway, which serves 100,000 stores, and Booker, which owns Budgens, Londis and Premier convenience stores, and delivers to 94,000 outlets. Earlier this year, Booker agreed to be bought by Tesco, a deal that could threaten P&H's relationship with the supermarket giant, which is one of its most important clients. However, the UK's competition watchdog, the Competition and Markets Authority (CMA), is currently assessing whether the proposed tie-up could reduce choice for shoppers and for small stores supplied by Booker. The CMA has said that if the deal did go through, there is the possibility that Booker could offer inferior wholesale terms to the stores it currently supplies, "in order to drive customers to their local Tesco". P&H is owned by its employees, both current and former, and has been in business since 1925.